Sorry for the mangy picture. I had a shot of the unopened bag and lost track of it. When Japanese folks eat rice, they generally eat it plain. Occasionally, they'll garnish it with a bit of sesame seek or place a pickled plum (umeboshi) on the top. I'm not sure if these things are added to enhance the rice or just for the aesthetic appeal of the contrast between the snowy white rice, black seeds, and red plum. The idea that one would put soy sauce in the rice is abhorrent to most Japanese people and the notion that you'd butter it is downright insane, yet many Americans have been known to butter their rice. It's little different than adding it to potatoes or spreading it on bread. Adding fat to starches is what we do. The way in which we conceptualize cuisine is far more limited than we imagine because we get into habits. Those patterns are governed by what is placed in front of us from childhood. When we had roasted corn, it was delivered with salt and/or butter. Oh sure, occasionally somebody's grandma may have rubbed it with beet juice or rhubarb pulp or some such esoteric combination, but it isn't common. For most Americans, it doesn't occur to us that we could brush it with soy sauce and that would add a rich, savory, salty dimension that could be incredibly delicious. In Japan, it is not uncommon to see roasted corn brushed with soy sauce, but I have never seen it here. 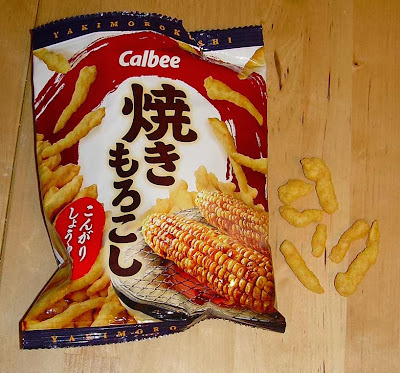 This being a Japanese corn snack, it's going to go with what they enjoy on their corn, so that's soy sauce. 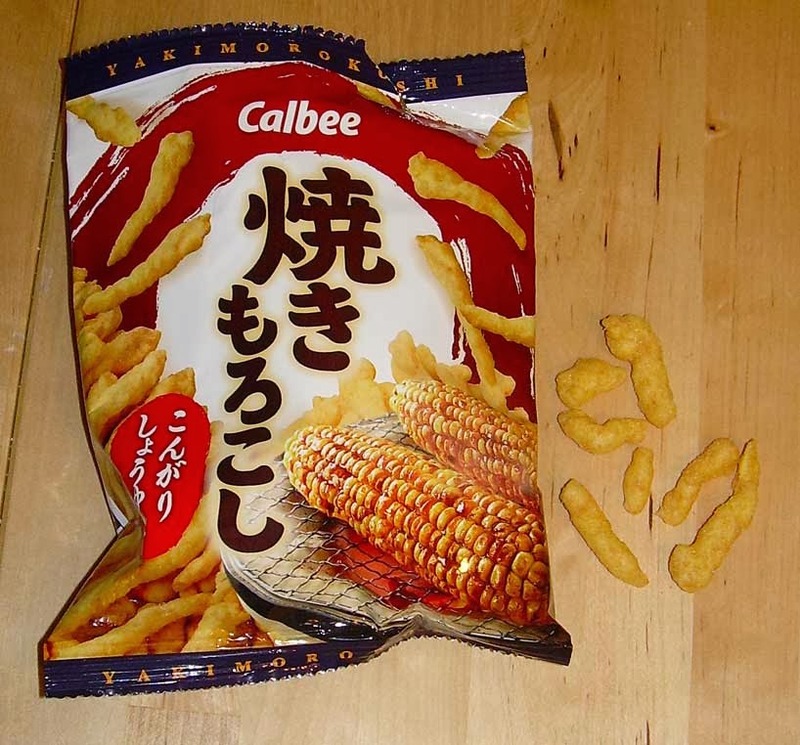 This corn snack is infused with the flavor of roasted corn brushed with soy sauce. Actually, it's a little low on the "roasted corn" angle and higher on the salt, soy sauce, and, yes, even a little sweetness aspect. It's a flavor combination with depth that plays well with the crispy corn base. One thing I love about Japanese savory snacks is that, most of the time, they have a fairly rich flavor blend. Many American snacks of a similar bent are one-trick ponies - fake cheese flavor, fake "barbeque" flavor (usually heavy on the smoked paprika), etc. In Japan, I find there's generally a richer mix of things like meat-flavored powders, onion, garlic, soy sauce, and yes, even fish powders. This mix includes bonito (essentially fish flakes) broth and kelp powder as well as soy sauce, sugar, and shiitake mushroom powder. You don't have to love any one of them because they come together in a rich melange of savoriness which is unique. I really liked these, though the hit of sweetness at the end came about as close to undoing the happy rating as it could come. It just wasn't quite powerful enough to step over the line, fortunately. I found this at Nijiya Japanese market for a mere 99 cents (it's a small bag at 26 grams or just a shade under an ounce) and it was well worth the investment. I don't know where others can locate it, but the package size and design screams typical "konbini" (convenience store) fare in Japan.